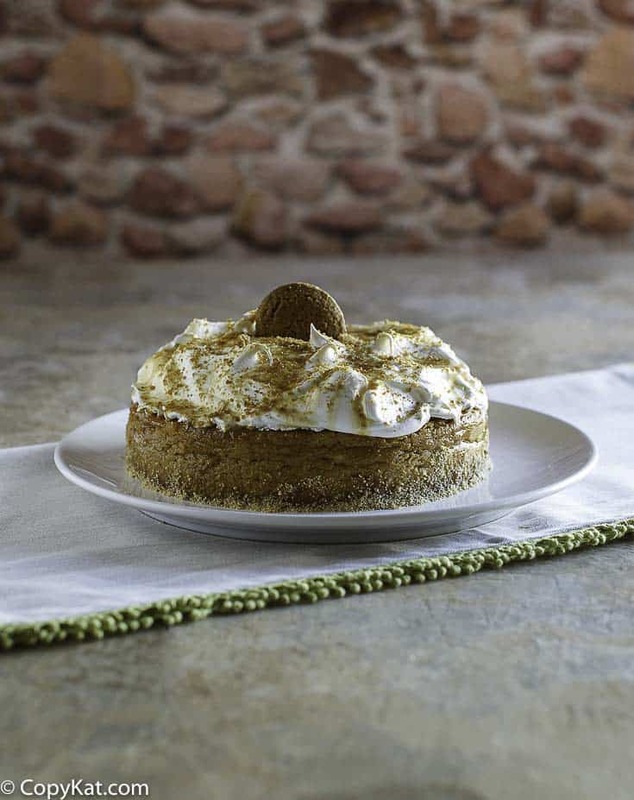 The Olive Garden Pumpkin Cheesecake is a seasonal favorite of so many dinners at the Olive Garden. This cheesecake is difficult to find at The Olive Garden because they only have it during the fall. You won’t have to be limited by the holidays any longer; you can make a pumpkin cheesecake that tastes just the restaurant’s recipe. This luscious cheesecake combines the two classic favorites: a New York Style Cheesecake and pumpkin pie. 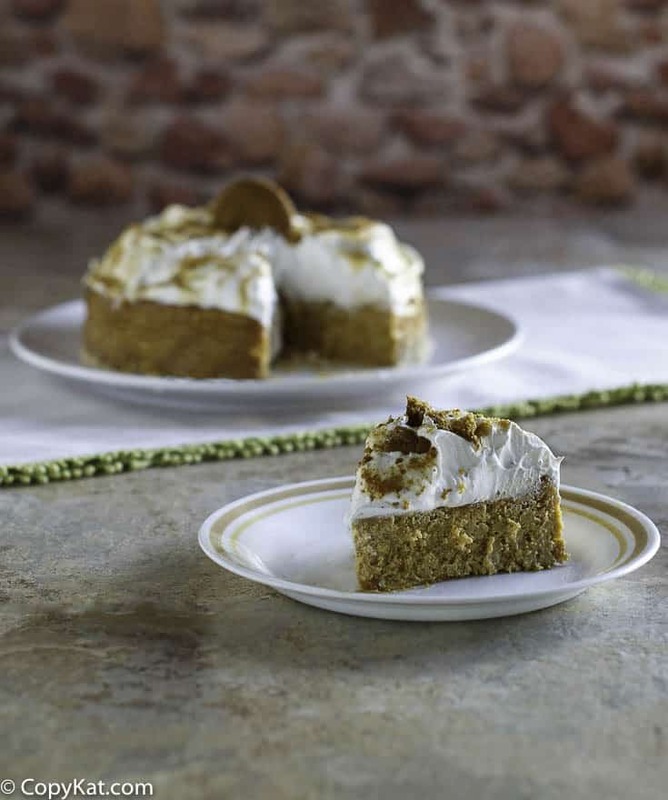 The flavors of the pumpkin pie are complimented by a ginger snap cookie crumb crust, sweet whipped cream, caramel sauce, and a sprinkle of crumbled ginger snap cookies. This cheesecake is difficult to find at The Olive Garden because they only have it during the fall. You won’t have to be limited by the holidays any longer; you can make a pumpkin cheesecake that tastes just the restaurant’s recipe.This luscious cheesecake combines the two classic favorites: a New York Style Cheesecake and pumpkin pie. 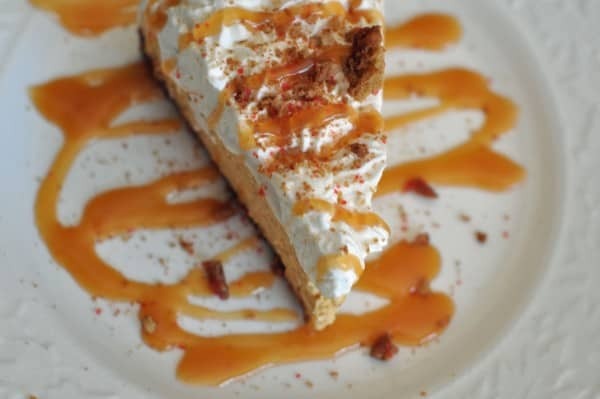 The flavors of the pumpkin pie are complimented by a ginger snap cookie crumb crust, sweet whipped cream, caramel sauce, and a sprinkle of crumbled ginger snap cookies. Enjoy the Olive Garden Pumpkin cheesecake, even more, when you make it at home with this copycat recipe. 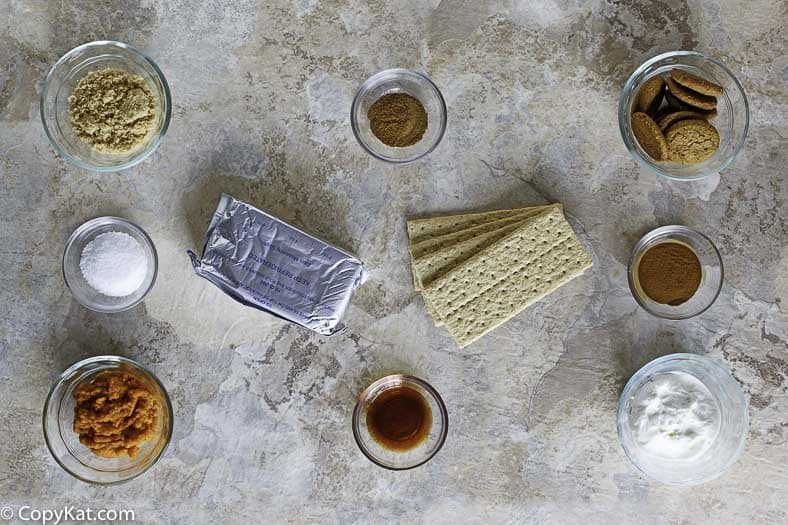 In a medium-sized bowl, combine graham cracker crumbs, gingersnap crumbs, sugar, and butter; mix well. Press crust into a springform pan. Press the crust about halfway up the side of an 8-inch springform pan. Refrigerate crust while you continue to prepare the cheesecake. Allow extra time for mixing up this filling. Remove the pure pumpkin puree from the can and place in a couple of large paper towels. Wrap the pumpkin puree with the paper towels; this will soak up the excess water in the pumpkin puree. Continue to remove excess water from the pumpkin puree for about 60 minutes before making cheesecake mixture. Bring the remaining ingredients for the filling to room temperature while the pumpkin puree is being drained. With a mixer, beat cream cheese until smooth; add eggs one at a time and then combine all ingredients for the filling in a mixer. Blend until very smooth. For best results, allow all ingredients to reach room temperature before mixing the filling. Remove crust from refrigerator, and pour in filling. Additional notes about cheesecake making: I personally do not use a water bath. I do have a clay baking stone in my oven, and my cheesecakes come out very well. You may wish to use a water bath when you prepare your cheesecake. Also, I would really urge you to let your ingredients reach room temperature before blending together the filling. This really makes a difference in getting a nice, smooth filling. Update - I know some people felt like there were nuts in the crust, so I wrote to the Olive Garden and here was their response. †If you will note, they state there are no peanuts or nuts in their recipes. So I am going to assume this meant no nuts in the crust of this cheesecake as well. I know some people felt like there were nuts in the crust, so I wrote to the Olive Garden and here was their response. If you will note, they state there are no peanuts or nuts in their recipes. So I am going to assume this meant to nuts in the crust of this cheesecake as well. We recognize the challenges with dining out when an allergy must be considered. Unfortunately, we are unable to provide the information you requested regarding nuts or peanut oil as an ingredient at Olive Garden. Identifying allergens is a complex process for restaurants as there may be minuscule amounts of ingredients our vendors may not list. As you know, peanuts have been hidden in pie crusts, gravies, chili, spaghetti, soups, and cheesecakes. While none of our recipes include nuts or peanuts, we cannot say with complete accuracy that there are no nuts or possible cross introduction of nuts in our restaurants stemming from our vendors. Our current nutritional database does not include information to the level of detail required for your safety. We are unable to recommend any items with the confidence that we all need. If Guest Relations can be of further assistance, please write us again through olivegarden.com(www.olivegarden.com/company/contact_us/ ) or call us at 800-331-2729. We look forward to serving you with Hospitaliano at any of our Olive Garden restaurants. Bake cheesecake at 350 for 30 minutes and then reduce temperature to 325 degrees for an additional 30 minutes. When you remove the cheesecake, it should be slightly jiggly in the center.The cheesecake will set up nicely as it cools. When you remove the cheesecake from the oven, set aside and prepare the seasoned cream cheese layer. In a small bowl, combine sour cream, sugar, and spices. Blend well. Spread seasoned sour cream mixture over the baked cheesecake evenly. Place the cheesecake back into the 325 degree oven for about 8 minutes, until the sour cream layer is set. Allow the cheesecake to cool. When the cheesecake is completely cool, you can add the whipped cream. In a medium sized bowl, combine heavy whipping cream, vanilla, and sugar; mix well with a blender or a stand mixer. Whip the cream until it forms stiff peaks. Remove ring from the spring-form pan and either pipe the whipped cream over the pumpkin cheesecake or spread with a knife. When you are ready to serve the Olive Garden Pumpkin Cheesecake, cut each slice, drizzle the top of the cheesecake with caramel sauce, and then sprinkle over ginger snap crumbs before serving. Can I use a 9″ springform pan? Will it affect cooking time? If so, how? Thanks! Yes, I would reduce the cooking time, or check it at amount 20 minutes before the stated time. CAN YOU MAKE THIS THE DAY BEFORE? IF SO, SHOULD IT SIT OUT AFTER REFRIGERATION BEFORE SERVING? OR SERVE IT COLD RIGHT OUT OF THE FRIDGE? WOULD I PUT THE WHIPPED CREAM ON BEFORE REFRIGERATING OR RIGHT BEFORE SERVING? THANKS! You can make it the day before, but you should refrigerate it. OMG!! Simply delish! All of those neighbor ladies wanted my recipe. I told them about your website. Have you tried this with fat free cream cheese and sour cream? I have not tried it with the fat-free dairy. The filling takes 3 eggs. Tried this again, for the second time. loved it. I made this pumpkin cheesecake for Thanksgiving, and you know what, it was great, and I didn’t even get a crack in it. How great is that?